After more than two years of development, SimGas has introduced a prototype of its ‘Biogas Milk Chiller’. BoP Innovation Center has been involved in this project from the start as one of the partners by providing support regarding an inclusive approach, the business development strategy and developing a marketing and distribution strategy. The biogas-powered milk chiller enables farmers to increase their income by eliminating (evening) milk spoilage or save time and money on milk transport. For dairy processors and co-operatives this product leads to more and a better quality of milk. The ‘Biogas Milk Chiller’ is developed by SimGas, Mueller, SNV, BoP Innovation Center and will be introduced by the end of this year in Kenya and Tanzania. Why the ‘Biogas Milk Chiller’? Milk demand in developing markets has been growing dramatically in recent years. Milk production in these countries dominated by smallholder farmers (80 - 90%). These farmers spoil 30 - 50% of milk production, 85% does not reach formal markets. To tackle this huge issue, the consortium partners decided to join forces and come up with a solution: the ‘Biogas Milk Chiller’. “By combining the knowledge of Mueller and SimGas we’ve been able to develop a biogas milk chilling system that meets European standards. It will enable farmers to raise their milk quality. And, it will enable us to deliver a high class product on the market. A great achievement all partners involved can be proud of!”, says Peter Fopma, ‘New Business Manager’ at Mueller. Peter Fopma continues: "It all started during a ‘scrum meeting’ two years ago where SimGas, SNV and BoP Innovation Center were present. It was on that day that we decided the pursue the idea of a milk chiller based on biogas. The idea itself was formed in 2012 already. Back then, we were working with Wageningen University and BoP Innovation Center to develop a solar cooler for farmers in Ethiopia, which will be introduced this year by the way. At the same time we looked at solutions which wouldn’t depend on energy from the sun. BoP Innovation Center introduced us to SimGas, and after some meetings it became obvious there was a match. They are experts in gas, we are experts in tanks and cooling systems - a milk cooler energized by gas seemed like a logical step." Farmers feed the biogas system with cow manure on a daily basis. Clean energy - biogas - is produced and used to power the milk chiller. Using the proven and reliable absorption cooling technology, heat from biogas combustion is used to generate cold. This cold is stored in an innovative compact storage system during the day and charges the system for a milk cooling cycle. The end user divides the evening milk produce over two five liter milk cans (sufficient capacity to meet the needs of > 80% of small-scale farmers in Eastern Africa), places them into the holders and starts the cooling cycle. The milk is cooled from 35°C to 4°C within three hours and subsequently kept at 4°C overnight, thus complying to international cooling standards. The next morning the preserved evening milk is delivered to the milk collection center together with the morning milk. Last year BoPInc has supported SimGas in the development of their marketing strategy, both for the initial pilot series and the eventual large-scale market entry. Since most of the work is still in progress, we’ll address the key areas of the marketing strategy and the major challenges on which we are currently working on. The overall complexity of marketing the Biogas Milk Chiller is that multiple actors in the dairy chain benefit: the farmer, dairy cooperative and the eventual processor. While taking all factors into account, the focus of the developed strategy was to ensure that farmers are convinced of the value the Biogas Milk Chiller delivers. The focus of this strategy was three fold. First, the actual message of the campaign had to be defined which would convince the farmer and coop of the Biogas Milk Chiller’s value. For this, SimGas (in collaboration with SNV) conducted extensive market research to understand the pains and gains of the farmers when it comes to milk production and collection. It was evident that there were several pain points when it comes to selling evening milk and bringing milk to a dairy collection center. All in all, farmers are losing time, money and business potential on evening milk. SimGas’ key focus in their communication with farmers is that these pain points will be tackled with the Biogas Milk Chiller. Especially in the initial phase of the marketing entry, SimGas’s sales team will be closely engaging with their customer in order to show them what financial gains they exactly will leverage by using the Biogas Milk Chiller. According to our research, this financial gain can be between USD18 and USD58 per month!! Second, we structured the process of communicating this message. For this, we used the ATEAR model as developed by BoPInc. It’s a helpful tool that provides a step-by-step approach on the first interaction with customer and eventual retention: Attention, Trust, Experience, Action and Retention. For the development of this model, the coops and processors will be a key partner by enabling SimGas to approach farmers and building a strong relationship. Also the ‘Experience’ part will be crucial since SimGas will have to convince farmers of this new-to-market innovative system. For this, SimGas will organise product demonstrations at cooperatives and provide trial period to farmers. Lastly, we defined an implementation plan on how to roll out the first series of production. With the support of SNV, SimGas analysed the dairy market in several East African countries. Based on this research (and SNV’s experience working with cooperatives), we shortlisted several potential cooperatives that might be supportive of introducing Biogas Milk Chiller to their farmers. This summer, the initial badge of functional Biogas Milk Chiller prototypes will be produced, after which the Biogas Milk Chiller will be launched in Kenya in October. Exciting news! 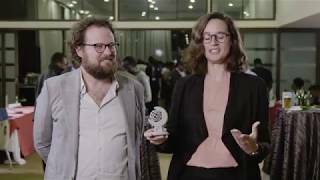 The Biogas Milk Chiller is one of the winners of the OpenIDEO Challenge for solutions which contribute to a better livelihood for smallholder farmers. We're very proud for contributing to a solution which received acknowledgement and praise from the global design community. Congratulations to SimGas and partners!